Originating in Great Britain the Light Sussex is a hardy variety that will thrive in all weathers. In existence for 2000 years, the Sussex is one of the oldest breeds in the UK. The foundation of the Sussex is probably due to the Romans introducing birds from the Ardennes region of Belgium and mating them with a form of Old English Game. The Red Dorkings are also of the same foundation. The Sussex having single combs as a standard, rules out any Malay or Asiatic bloodline. They are large fowl with the classification being 'heavy - soft feather'. 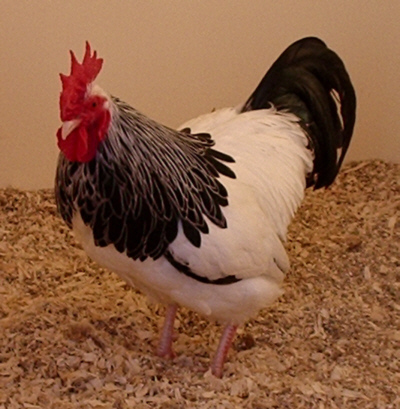 In 1903 the Sussex Poultry Club was formed to preserve and standardise the breed. The main colours of the Sussex are Light, Buff, Speckled and Silver with White or Light being the dominant and most popular colour. The markings and colouring of the Light Sussex should be as follows. Hackle feathers should have a very distinct black stripe down the centre and the shaft should also be black. The whole of the feather edged with white. The tail should be solid black to the root with a green sheen. Wings white with black in flights, with the remaining body feather to be pure white throughout down to the skin. The legs, feet and toe-nails should also be white.